As bloggers, entrepreneurs, and small business owners we are very busy people, right? We have the duty of building and maintaining our websites, engaging with our audience, and serving our customers the best we can. All that paperwork, not to mention all the marketing and promotion work and so on. You are responsible for a lot of things in your business, especially if you don’t do any outsourcing for any of the work, so please give yourself some credit where it’s due by all means. And of course, with any business website, you not only have to keep it running smoothly, but you are also responsible for ensuring that it continues to work for you, converting visitors into subscribers, leads, and sales. That means keeping your services page up to date, your contact details up to date, terms of business information up to date, and as I mentioned earlier, doing most of the marketing and promotional work. However, sometimes the most simple yet critical elements of your small business website can be easily overlooked. In this post, I’m going to share with you 5 simple ways to make your business website look more professional so that you can continue attracting new traffic and visitors to your site and converting those visitors into raving fans, and customers. Keeping your business contact details up to date is one thing, but ensuring that you have everything displayed prominently on your website is just as critical. Potential clients shouldn’t have to go searching for your contact details, even though you may have a dedicated “contact us” page for this. They should be able to access a telephone number or email address from whichever page they’re on. The homepage is essential for this. So, if you haven’t already done this, ensure you have a contact number, email address and even your business mailing address displayed in the footer of your website, at least. I know this might sound like such generic advice here, but I can think of a dozen business websites that I visit frequently that don’t have any contact information visible on their most visible pages. Here in the UK, it is a legal obligation to display certain regulatory information, including business contact number and business address in the footer of your website. First of all, if you don’t have a testimonials page, you really need to get one created as soon as you can. Check out this awesome post on Thrive Themes about how Marie Forelo used testimonials to grow her business exponentially. Testimonials from genuine customers of your business services can really help you sell more, so let your customers do the talking. This is vital. 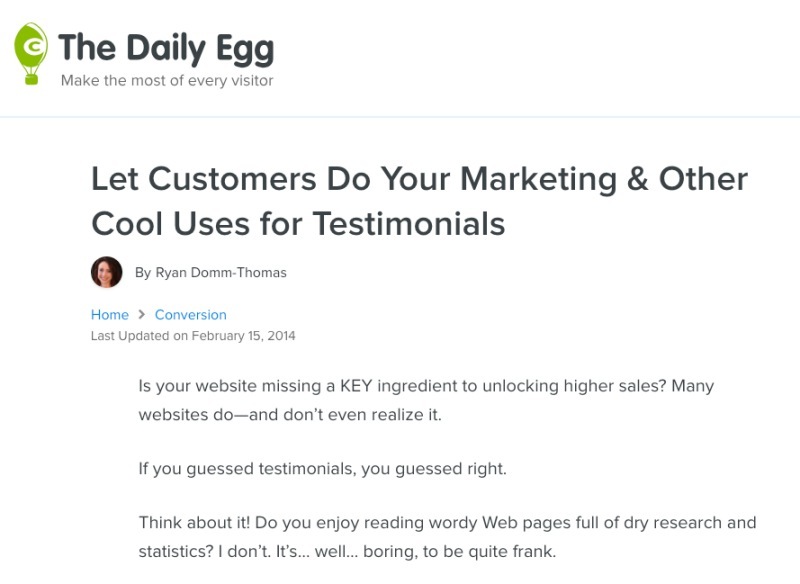 Check out this post on the Crazy Egg blog for some interesting insights on using client testimonials. If you need some inspiration in creating a testimonials page for your website, take a look at mine here for ideas. If you already have a testimonials page, it should be easily accessible from the main navigation menu. You should also consider placing a few of your ‘best’ and most recent testimonials in your homepage or sidebar with a link to “view more”. Your business website will have a blog no doubt, and if it hasn’t, seriously consider creating one. Setting up a blog won’t cost you the earth, but having one could make all the difference in helping you grow your business and reaching out to new prospects. If your business website has a blog, consider converting one or two of your client projects into case studies. Explain how you were able to solve a pressing problem for one of your clients using your products or services. Be sure to first check with your client that it’s OK to use their project for a case study report on your blog. You might need to use some made-up names for the sake of privacy and confidentiality. This goes without saying, and I know I’ve mentioned this in almost every single post I’ve written about building a successful website Magnet4Blogging. Your content is the soul of your business website, so, ensure it’s always of top-notch quality and that it always puts your audience and customers need first, before yours. Create quality content that talks less about how great your business is, or how awesome your products and services are compared to your competitors, and more about addressing your customer’s needs in every way possible. I know you know this already, but it doesn’t hurt to remind you that design is key! Having amazing content is one thing, having a well crafted and well-organized website is another thing completely. I visit dozens of websites and blogs each week. Only a small handful of those that I visit have truly amazing content, however, when it comes to design and layout, those websites could do so much better. Of course, out of complete respect for those website owners, I won’t mention them here. If you take pride in the value of your brand, if you value the content you produce, even more, then it all starts with having a flawless design. Your business website should flaunt a clean, bold design, with well organized and structured content elements. Your design should be free of any unnecessary conversion crushing design features. Navigating around your site should be easy on all screen sizes, desktop, and mobile. Your business website should be quick to load. This is very important! If you’re having problems in any of these areas highlighted above, or if you simply need a website that works for you and your business, then please click this link to see how I can help you. I’ve made the five steps above actionable for you, which means you can get started on them straight away. Don’t waste another minute turning visitors away that could potentially be new customers. Stop wasting time and money, get on the case! Lose Your Limits: Grow Your Business: The 5 key system to go from struggling business owner to limitless entrepreneur. Hi, Fabrizio, welcome back to the world of comments 🙂 I haven’t posted in ages but I’m getting back into the flow… slowly, things take time! I’m just at the stage of developing products so no testimonial page at the moment but I can definitely see it’s a necessary thing. In the past year I’ve implemented a good dose of your recommendations so no doubt I’ll be checking back here to see how you implement this one. Thanks for these pointers, have a good week! Nice to see the comments are back! YEA!!!! Couldn’t agree with you more on every point. I think that have your “all” your content information in the footer of every page demonstrates that you’re a real entity / person who is easily accessible. I also include my Skype address. Testimonials – you bet! I proudly want people to see the fantastic work I do for my clients and my testimonials can be quit long. Last week Adrienne Smith even wrote an guest post article for my site about why she hired my as her business coach and the results she got 3 months later that has changed her business forever. She wrote the case study! Now that’s really cool when someone can say it for you. Great post Fabrizio. It’s good to be back conversing with you once again! Don that’s truly amazing, the power of testimonials huh, and to have Adrienne add even more validation about your business coaching by writing about her own experiences with you in the form of a guest post? Priceless. Thanks for sharing this here Don, have a great weekend ahead. Hi Donald, thanks for taking the time to read and comment, and your kind words about my recommendations, that means a lot. Yes I made the decision to bring comments back a few weeks ago, was easily one of the “worst” decisions I made this year removing them. You made a very good point about using a picture, something I missed added but so glad you brought it up, thanks for adding value to this post. Many sites have a testimonials page, but it’s amazing how few of them feature case histories. Sometimes the testimonials lack punch, but a good case history or two will give potential customers the extra validation they need to move forward and make an inquiry, or buy. Speaking of testimonials, a standard, boring run the mill testimonial can be transformed by turning it into a testimonial story whereby you top and tail it with some engaging editorial. Build the narrative! Another point is that a testimonial should include the person’s name and their location (not their street address of course) and also include a pic of the happy customer. Detail points like these can transform a testimonial. The best testimonial is a video testimonial, providing the customer conveys some enthusiasm and authenticity. I also think your point about design is spot on. Some bloggers and business owners neglect good design. If they take shortcuts in this area they will pay the price – good design can help conversions, no doubt. Hey Kim great to see you here again, you’re absolutely right about case studies, they can work greatly. I just look at Neil Patel’s posts that are almost always case studies and data drive articles, they rock. I love the fact that as well as providing value and insight, they also provide a lot of validation as well. Love it. Now video testimonials if people can take the time to do must be quite effective, I know from visiting your blog I’ve seen quite a few video testimonials, that’s awesome mate. Digging all of these tips. I have a nice juicy page of Endorsements from a few of my eBooks posted to my blog. It can help to have backing from happy fans and readers because some folks buy in to social proof. If you have fans, show em off, right? As for me, I keep things simple and clear on BFP. And clean too. Just biz pages and eBook ads and endorsements and About Me page, along with pictures of paradise in my sidebar. Selfie images from paradise. It aligns with my brand so well and also, it keeps readers focused on my content which is the key selling point on all blogs. A bit weak on endorsing my endorsements, I may bump that up going forward. Thanks much for sharing Fabrizio. Your paradise selfies are truly your signature, I have to look twice when I come across an paradise pic on social media these days because I automatically connect them all with you and BFP 🙂 That must be a good thing right? Anyway keep doing what you’re doing my friend, enjoy the rest of your week and thanks again for stopping by – Fabrizio. Oh god. I have a lot of tweaking to do – I haven’t accomplished any of these! I do focus on creating irresistible content right now because that’s something that I can accomplish on my own, but creating a better design for my blog would probably need the services of a professional designer. I might hit you up sometime in the near future! Welcome and great to have you commenting on my blog. Take care for now. Hey Fabrizio, Well, I like the idea of turning your client projects into some case studies and have it featured in one of your blog posts. Great post!